I started working on my year end lists but the end of the year is always a really busy time for me. The list is partially done. I'll add some stuff I know I missed (don't know what they are just yet but I know I missed) and definitely take a couple out. I might even do a separate 'best of' remix(ers) or something. Oh another reason I'm not done is that I can't turn off the TV. What a vice. Everybody talking about this show or that show. It's a digital keeping up with the Jones'. To top it off, Netflix is now streaming movies online so you don't even have to wait for the DVD. Boxee is heading out of alpha (or beta?) in January and I promise is going to change how we watch TV (just wait and see). Well, fitting that WhoMadeWho named TV Friend as the first single of their sophomore album The Plot (due out March 2009). For the record, I don't consider the Green Album as their second album since it is just (an ridiculously awesome and a must have) reworking of their debut Red Album. It's been a few years (almost four) since their last release. For those of you in Miami, think back to The District Thursdays. I think a burned a whole in both CD's when I got them so I am pretty anxious for this release. The first single just wets my appetite for the entire release. They seem to have picked up where they left off. On December 4th we did an unannounced New Year’s Eve show for our friends at the tiny Ritz club in Copenhagen. After a solid, traditional Danish Christmas dinner of herring, pork and schnapps we got a old-school Danish viking party vibe going. People were drinking, dancing and kissing everywhere. Our bass player Tomas’ girlfriend even broke her leg. Truly a night to remember ! 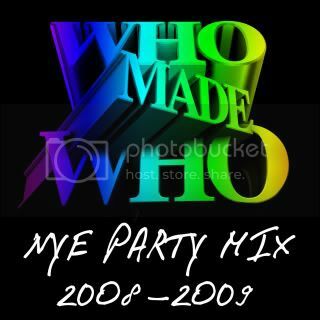 WhoMadeWho played live, great local DJ’s were playing, and we recorded the whole thing, so that you can now download and have WhoMadeWho play your New Years Eve house party! Happy Holidays Everybody!! Stay Safe!! All this talk about danishes and I'm getting hungry for a cheese danish. Seriously. No joke.